The following is the visiting record of Full Korea from the past week. 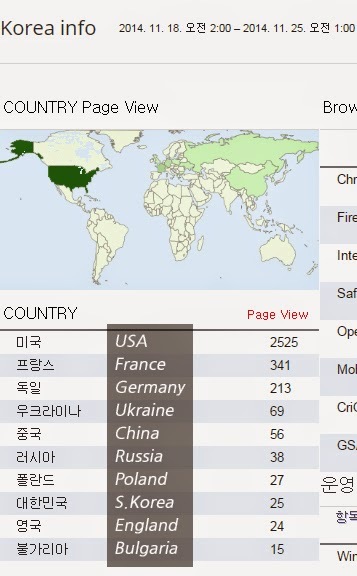 It shows that people in the U.S. and France visit our blog the most often. Korea is seen as a very poor, difficult, and a country at the risk of a war. It is certain that these problems must be fixed. and the most advanced smartphones. It is the only country where people use credit cards for all public transportations. It is a country with strong global brands such as Samsung, Hyundai, and LG. that achieved the most and best economic performances in the shortest time. and has fewer gaps between the rich and poor than in the U.S. It has more strengths than weaknesses, which is only one of the few in the world. We would like to show the good sides of Korea to the world. We want to inform the problems and issues of Korea of the world. This is why Full Korea exists.